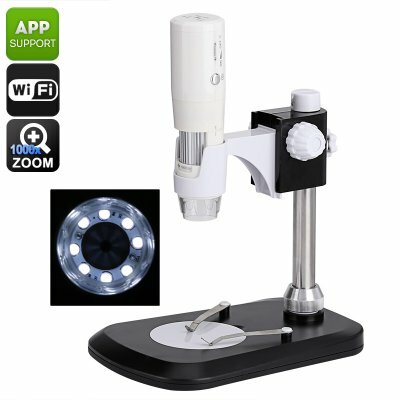 Successfully Added Digital Microscope - 1000x Zoom, 2MP Sensor, 8 LED Light, WiFi Support, Android and iOS App, 600 LUX to your Shopping Cart. This digital microscope allows you to observe everyday items in extreme detail – letting you experience the world like never before. The USB microscope itself features a compact and lightweight design, making it highly portable. Additionally, it packs a rechargeable 1000mAh battery, letting you use it virtually anywhere. Perfect for students and researchers alike, this digital USB microscope is great for conducting field research. Compatible with both iOS and Android smartphones, this digital microscope can be efficiently used with the majority of smartphones on the market via its dedicated mobile application. With its 2.0MP sensor, this digital microscope lets you observe and snap great pictures of any material. Featuring 5 – 1000x zoom, you can be assured that even the slightest detail won’t stay unnoticed when using this portable USB microscope for your upcoming analysis. With its 640x480p resolution, all material captured by this digital microscope will be of high quality. Simply download the mobile application, connect the digital microscope to your WiFi network, and you’ll be able to instantly analyze and share files in between your newly acquired USB microscope and smartphone. This portable USB microscope features 6 intergraded LED lights that come with an adjustable brightness. Additionally, it has an easy design that can be effortlessly operated by anybody out there without needing any previous knowledge. Perfect for hobbyists, students, and researchers – this digital microscope is guaranteed to meet all your demands.